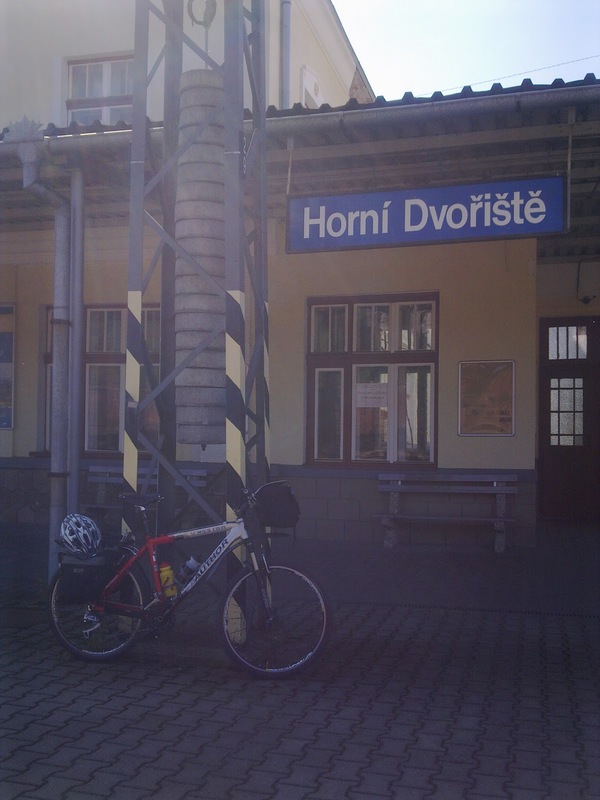 I'm on the train, heading back to Prague via Brno after completing the latest stage of my Circuit Ride. 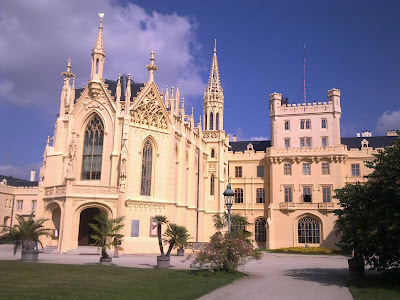 Today I took a detour away from the border to ride the sandy trails of the Lednice-Valtice Park (Lednice Chateau pictured). Thanks to the wonderful weather, the relatively easy terrain and the easy-going Moravians, this has been the most relaxed stage of my trip so far. Only one more stage to go now, back to the start in Bohumin. But will I manage it this year? Extraordinarily, the owner of the B&B I stayed at in Znojmo, Derek, turns out to be from my home town of Stoke, so we had a nice chat over a cup of tea at breakfast this morning. 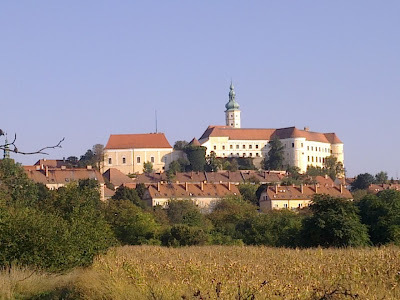 I then cycled 90 km through the vast vineyards of Moravia and Austria in unseasonally hot weather. After doing battle with an uncyclable cycle trail, a scary main road and a forest full of dangling spiders (even more scary) I arrived in the charming historical town of Mikulov, my destination for today, late in the afternoon. 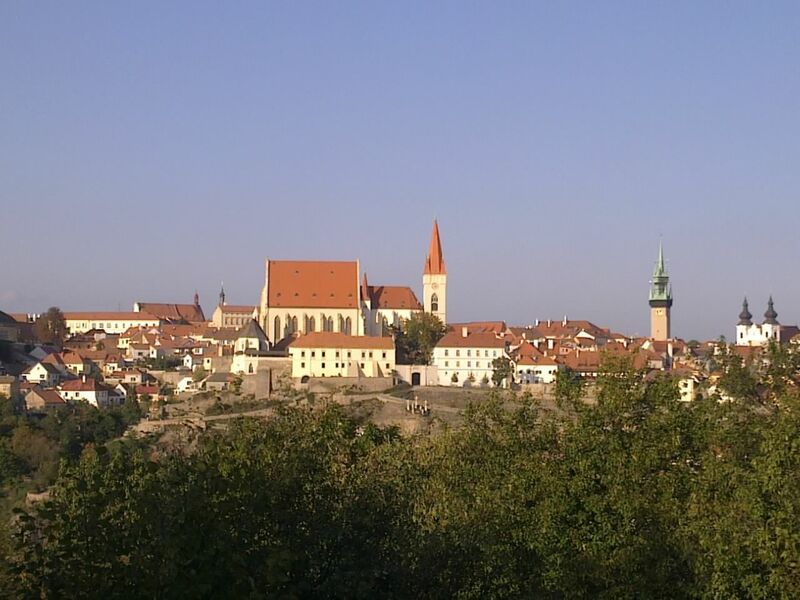 Tomorrow I complete Stage 6 with a fairly short, flat ride to Breclav. 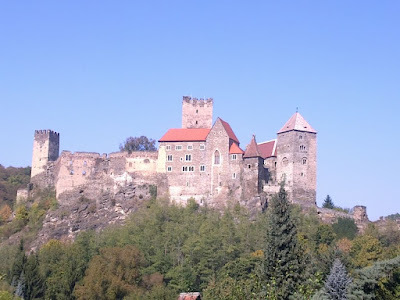 ...perched high above the River Thaya on the Austrian-Czech frontier. 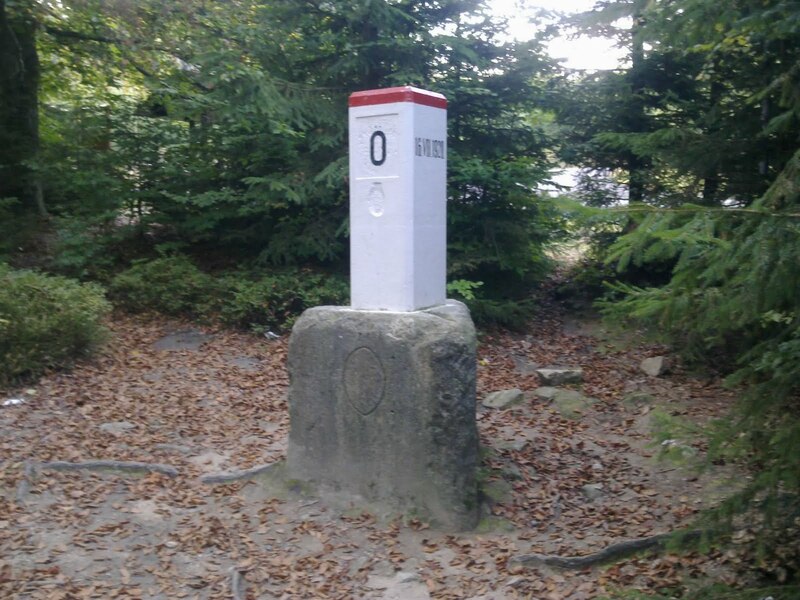 Pictured is the point where Bohemia meets Moravia meets Austria. 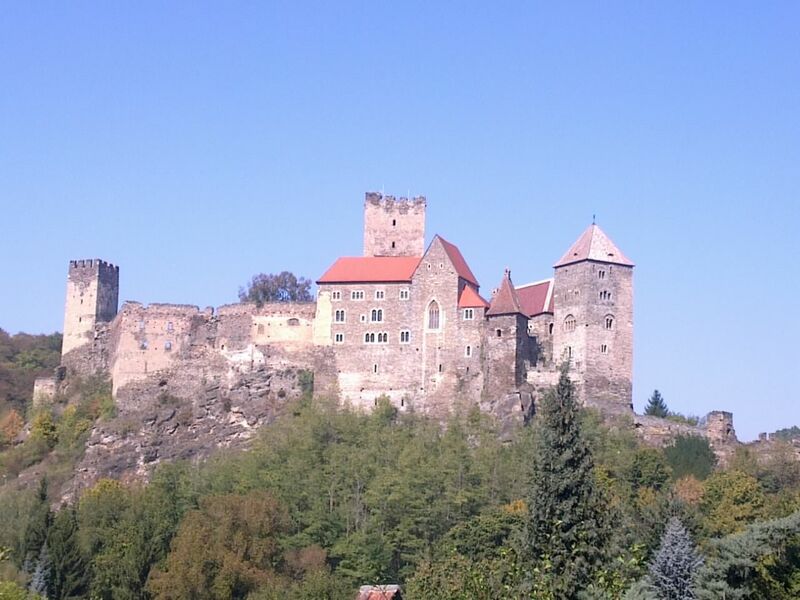 It lies not far from historical town of Slavonice, where I'm spending the night. Highlights today included Gmund, a town that was literally divided by the Iron Curtain, as well as a short diversion to the northernmost point of Austria. Tomorrow I'll be passing through two national parks en route to the wine-making town of Znojmo. Cheers! How I love September! After a fine autumn afternoon's cycling through the forested hills of deepest South Bohemia I've arrived safely in Nove Hrady as planned. Tomorrow I ride west into Moravia. I've just got off the train into the warm autumn sunshine to start Stage 6 of my circuit ride. My destination today: Nove Hrady. It’s raining here in the Czech Republic and has been almost continuously for the last two days. However, we’ve been enjoying some fine weather for most of this month, and according to the forecast the Indian summer is set to return today. This is good news for Stage 6 of my circuit ride, which is due to start on Saturday. 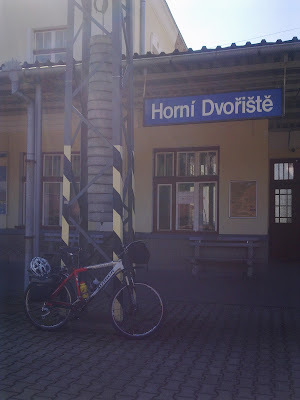 I’ll be travelling for five days from Horní Dvořiště in the south-west of the Czech Republic to Břeclav in southern Moravia (click here for more details). Preparations are in full swing. 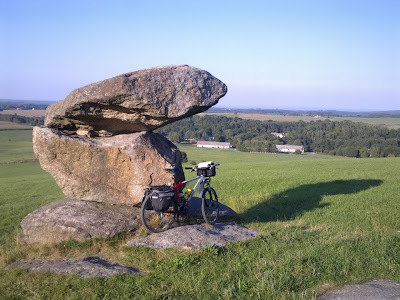 Over the last couple of weeks I’ve been refining my route (using, among other things, the excellent Cykloatlas online cycling atlas of the Czech Republic and Slovakia) and learning as much as I can about the interesting places I’ll be passing through. I also have a full set of maps printed out and installed in my map holder. The next step is to reserve accommodation at each of my overnight stops - in Nové Hrady, Slavonice, Znojmo and Mikulov. Booking in advance is probably not really necessary at this time of year, but it does mean I’ll have one less thing to worry about on the road. I’ve drawn up a shortlist of interesting-looking guesthouses (partly with the aid of the Cyclists Welcome website) and I’ll be contacting them over the next couple of days. The other thing I need to do is book myself and my bike onto the relevant trains. Thanks to the Czech public transport timetable website I know which services carry bicycles and which of them have mandatory or optional bicycle reservation. Unfortunately I can’t buy bike tickets online, so I’ll have to go down to the main station in Prague later in the week to do that. The day before I leave I’ll print out my packing list, gather all my stuff together and load up my bike ready for departure. On Saturday I’ll get up early, head down to the station and catch the 9.16 am express to České Budějovice. If all goes to plan, I’ll reach the official start point shortly after 1 pm and immediately set off into the Nové Hrady mountains. Hopefully I’ll have both the autumn sun and the prevailing westerly wind on my back. Last November I wrote a post celebrating the first anniversary of this blog. In it, I commented that writing the posts, rather than cycling the miles, had - to my surprise - proved to be the toughest aspect of my circumnavigation of the Czech Republic on a bicycle. On the basis of my experience this summer, I have to revise that view. I still maintain that the cycling itself, while being certainly very hard work at times, has been the easy bit and that writing up my exploits is certainly the more laborious task of the two. But the most difficult part of all has been to find enough time for circuit riding at all. Take this summer. Originally I’d planned to do Stage 6 of my circuit ride in July or August. I could make excuses about the bad weather (July, for example, was a washout), but the truth is I’ve been too busy with work, family commitments and (yes, I admit it) other holidays to get on with my journey. Now I find myself in September - with two stages and some 500 miles left to cover - and my diary is still almost full. Where this leaves my plan to complete the whole project this year, I’m not sure. However, I can see a window of opportunity. At the end of September - on the 28th, to be precise - there’s a public holiday in the Czech Republic. It falls on a Wednesday. This means that by taking just two days off work (Monday and Tuesday), I can engineer a break of five days (Saturday to Wednesday), which is exactly how much time I need to ride Stage 6 (from Horní Dvořiště in southern Bohemia to Břeclav in the south of Moravia). You can consider it pencilled in. Then all that will remain is Stage 7 - the final leg back to Bohumín (where I started in May 2010). Whether I still manage to do that this year depends most of all on the weather in October. At some point in the autumn, the Slavic weather gods will switch off the heat and we’ll be plunged into at least five months of winter. And that, in turn, means no more circuit riding till the spring. Needless to say, I’m praying for an Indian summer. Bohumín: when will I see you again?